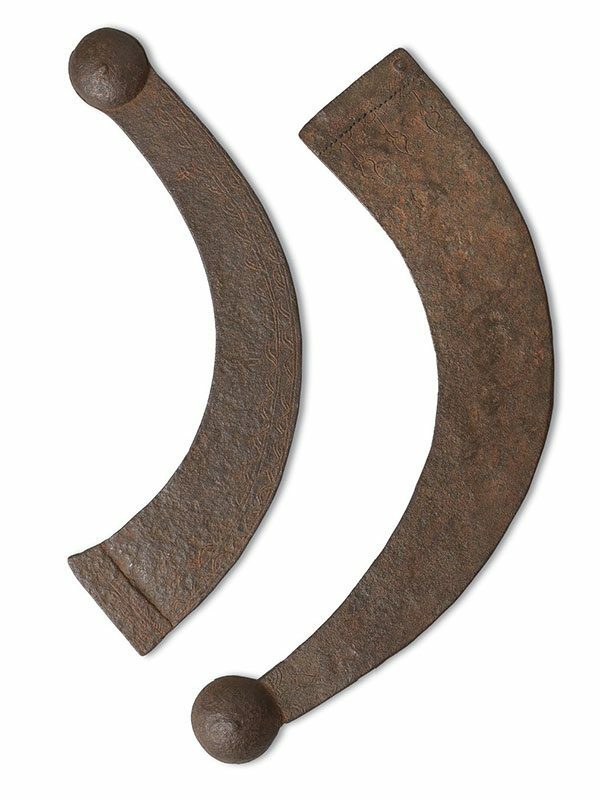 Two iron throwing weapons (boomerangs) known as valai-tadi. The valai-tadi are crescent-shaped with one end heavier than the other. A bell-shaped pommel provides a simple handle. The larger valai-tadi has a chased leaf decoration and a reinforced striking end. The smaller valai-tadi is lighter, but more decorative, the reinforced end has a dense pattern of leaves, with two rows of half circles along the spine, and three four-petalled flowers on each side. These South Indian throwing weapons are made of iron and known as Valai-Tadi, a Tamil word translating to ‘curved stick’. Other regional names used are Birundungi, Katariya, or Valari. Although these pieces are probably purely ceremonial, boomerangs of similar shape, but fashioned of wood or horn, were used for hunting in the Indian sub-continent. The better- known “come back,” or “return” boomerang is used primarily for sport or for hunting birds. The larger valai-tadi shown here is bigger and heavier than most. This suggests that it was probably used for larger animals, or even warfare. The smaller valai-tadi is less likely for battle use, and rather for hunting small animals. The form itself presumably is of very ancient origin, used in warfare and hunting – the term boomerang is perhaps misleading, as it is a non-returning weapon. All surviving examples share several features in common, the ball or egg-shaped knob for gripping, flattened deeply curved body, and a squared flaring end. Similar examples are in the British Museum , in the National Museum, Liverpool  and in the Worcester Art Museum in Massachusetts , amongst others. Elgood (2004) illustrates a similar example from the National Museum, Liverpool (No.6.6.28D), fig.19.7, p. 191.